Nestled high in the Swiss Alps, in the shadow of the Eiger, Monch and Jungfrau peaks, sits the picturesque small village of Wengen. A worthy holiday destination in any season, the automobile-free Wengen offers direct access some of the best and most plentiful snow sports in the Jungfrau region. Cozy snow-covered chalets, nestled among turn of the century hotels, offer a comfortable contrast to the state-of-the art infrastructure and high-tech equipment found on the snow, all of it second fiddle to the stunning views of snow-capped Alp peaks in every direction. Accessible only by a cog-rail train from the village of Lauterbrunnen in the valley below, Wengen sits at 1274 meters above sea-level. However, the Männlichen (2343m) peak above Wengen can be reached by cable car from the center of Wengen, and gives access to a vast collection of slopes, trails and runs – both on- and off-piste. 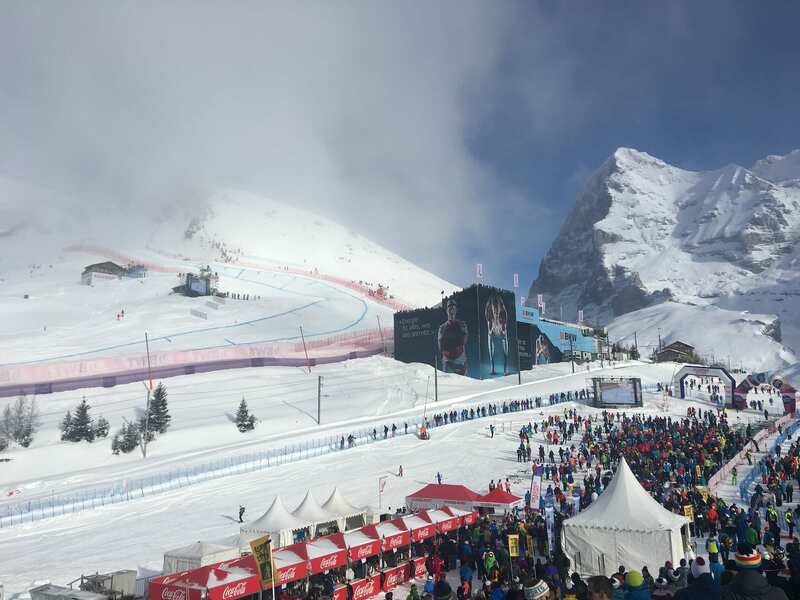 Wengen has a permanent population of about 1500 residents, but its population swells past 10000 people in the winter and reaches beyond 20000 visitors for the weekend when the legendary Lauberhorn World Cup ski race comes to town in the middle of January. Track detail of the longest cog railway in the world. In the shadow of the Monch summit. Canadian Corner on the course at the Lauberhorn World Cup in Wengen, Switzerland. 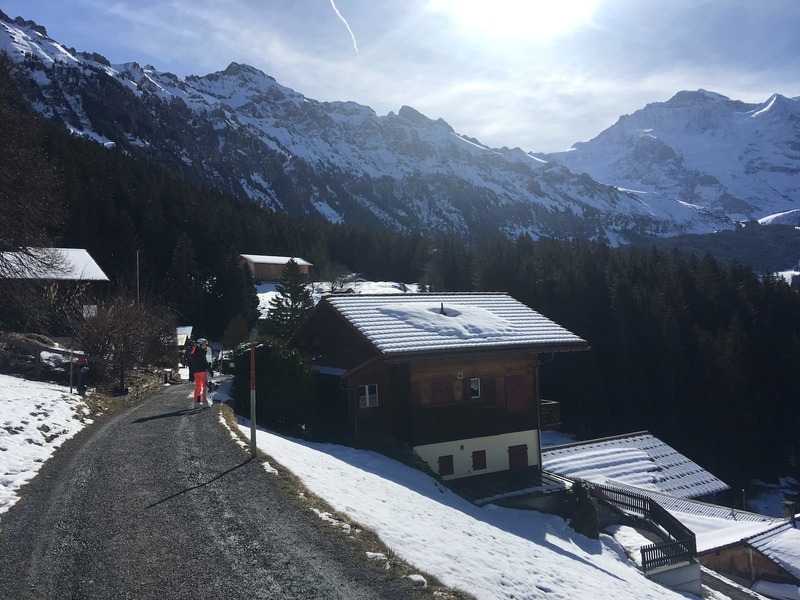 While its car-free remoteness offers a lovely experience, Wengen offers just about all of the amenities you’d want or need for a memorable winter holiday. 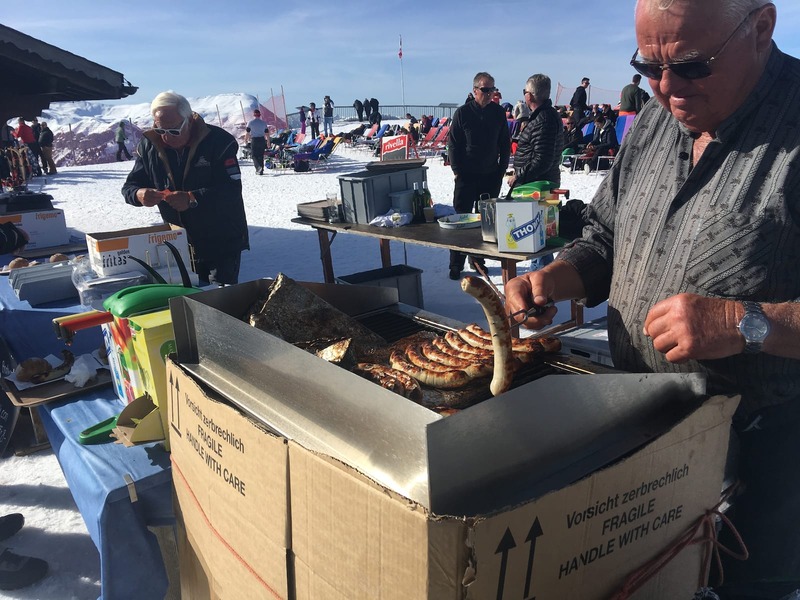 There are plenty of restaurants, bars, two small grocery stores, several ski shops and at least a few souvenir shops where you can get your authentic fondue pots and Swiss Army knives. There’s even a 200-seat cinema that shows current top-run films in both English and German. Outbound flights from the UK can fly into either the Zurich or Basel airports, which are equidistant from Wengen. Most major airlines fly into either airport, but Basel welcomes low-cost carriers such as EasyJet. Wengen is about a two and a half-hour train ride from either airport. A country known for its precision and efficiency, Switzerland’s rail system is a vast and accurate network of trains that runs like…well…a Swiss watch. It’s quite an amazing experience, as the trains are spotless, on-time, fast and reach every corner of the country. Plus, the scenery outside the train windows is absolutely breathtaking. A train departs the Wengen station on its journey up to Kleine Scheidegg. All trains pointed towards Wengen terminate in Lauterbrunnen in the valley directly below Wengen. It’s here where passengers switch trains for the final time to board the 14-minute ride up the cog-rail train to Wengen. Car hires are available at both airports, and it’s less than a three-hour drive to the parking garage in Lauterbrunnen (it’s strongly advised you reserve a spot in the garage well in advance of your arrival). It’s a pretty drive from either direction, but remember you will be driving up, over and through the Swiss alps. It’s not all highways, and winter weather can make passage over some of those mountains breathtaking in a less desirable way. Because Switzerland’s train system is extremely easy to navigate and since your hire car would go nowhere other than the parking garage for a week, taking a train from the airport is the recommended way to go. Visit the easy to use SBB web site for train schedules and tickets. Wengen has plenty of lodging options, though it can be pricey. 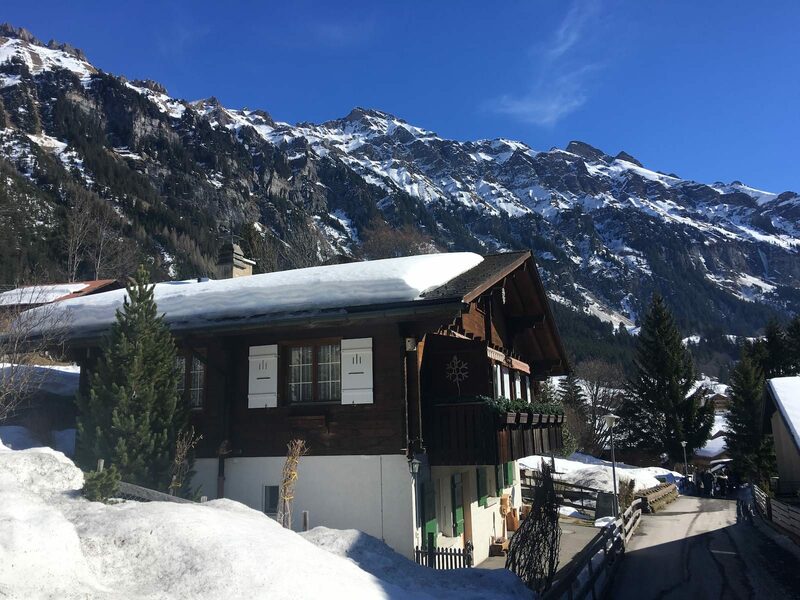 Visitors on a tighter budget can have a look at the Valley Hostel in Lauterbrunnen, while travelers with a limitless level of disposable income can be treated like royalty at a few hotels in Wengen, such as Sunstar or Victoria Lauberhorn. There’s also a small hotel on the Männlichen summit, which is reachable only by the cable car in winter. Travelers on a more average budget might be interested in hiring an apartment, condo or house during their visit. By no means cheap, at about of 2000CHF (£1500) for a week, a family of four booking a two-bedroom apartment is a lot less expensive than booking two rooms in a hotel for a week. Plus, you’ll have your own kitchen, which gives you the ability to cook your own meals – saving a lot of money. 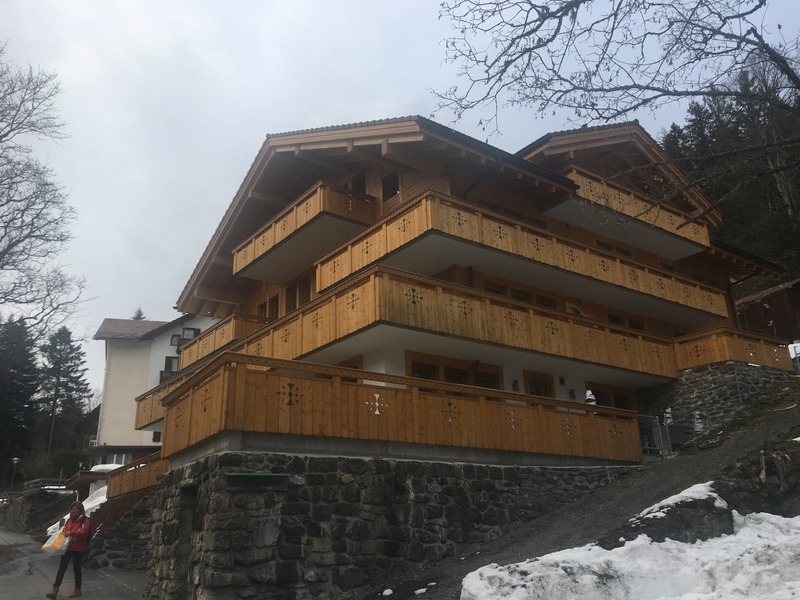 Renting an apartment or chalet can be much less expensive than a hotel in Wengen. The views and atmosphere of a chalet in Wengen offer a breathtaking experience. I generally choose the latter, as eating out every night gets quite expensive, and I prefer the cozier atmosphere of an apartment or house. You can search and book apartments and houses by visiting here. 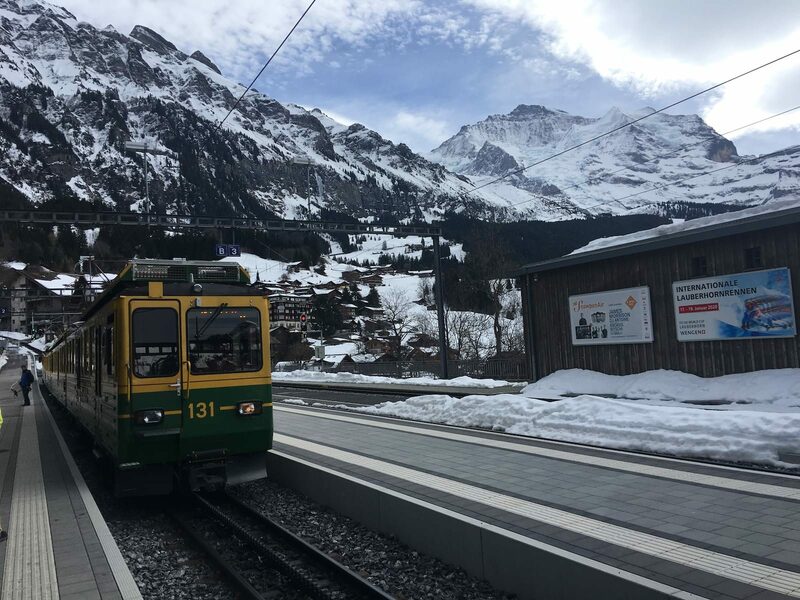 While Wengen is a car-free village, there are a few micro vans and glorified four wheel-drive golf carts ferrying visitors to and from the train station or making deliveries to local businesses. There’s usually always at least one of these vehicles waiting at the train station for a travel-weary family stepping off the train with too much holiday luggage. 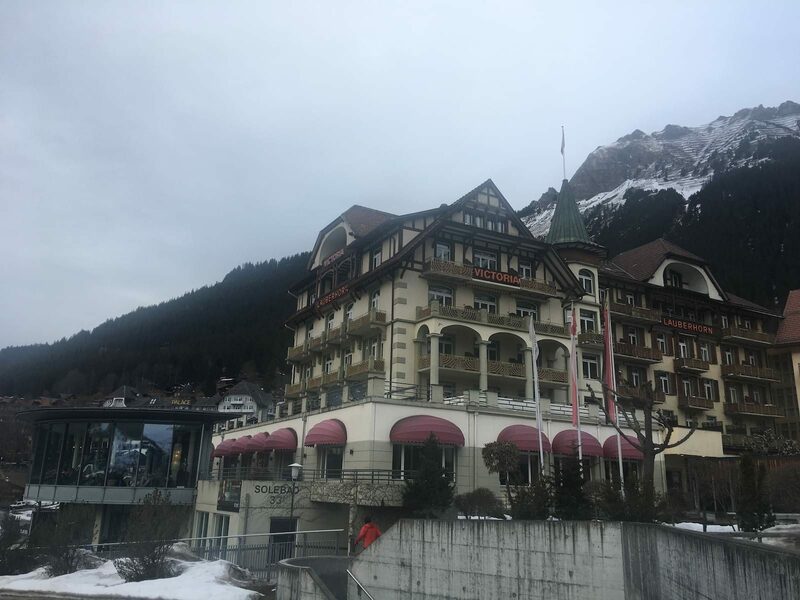 Because Wengen’s snow-covered roads go up AND down, it’s well worth spending 25CHF to get you and all of your baggage to your hotel or apartment. One example of the vehicles used to taxi visitors in Wengen. What holiday get-away is complete without some good food and drink? Wengen has lots to offer in this department, though be prepared to see some high numbers on the bill at the end of your meals. The remoteness of the village, combined with the overall higher prices for food in Switzerland, means you’re going to spend a good chunk of your budget on dining. You can expect to spend an average of about 45CHF (£35) per person for a meal, including a couple of drinks. Beers average about 7CHF (£5.30) each. Any country as dependent on the cow as Switzerland is good in my book. 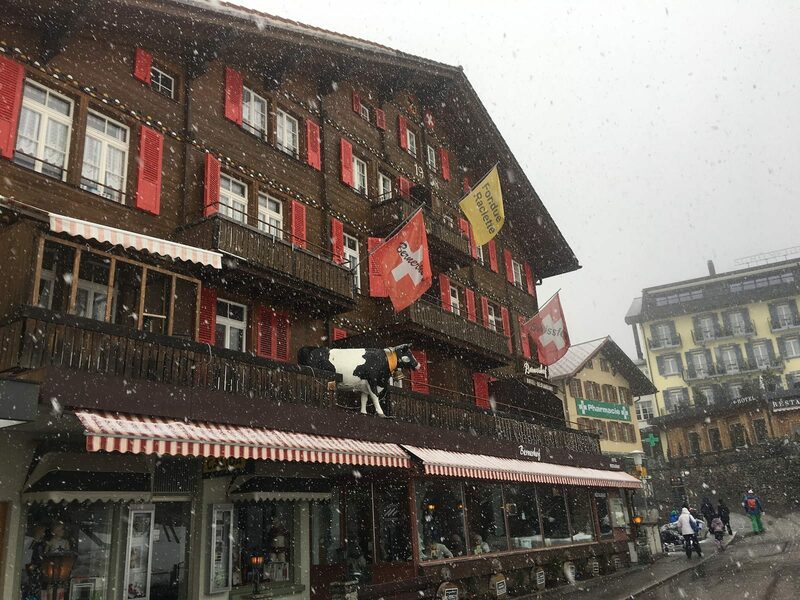 Wengen is definitely a tourist destination, but it’s still an active farming community – especially in the summer when cows are scattered across the whole mountainside, including most of what are ski slopes in the winter. There are vegetarian options in just about every restaurant in town but be prepared to enjoy all manner of meat and cheese dishes – most of which are locally sourced. Just about every hotel in town has its own restaurant, which are all open to the public. Reservations at any restaurant are recommended, especially in high season. The Bernerhof restaurant in Wengen offers delicious local and regional fare. The Bernerhof restaurant in the center of town offers a very nice take on regional and typical fare such as fondue, steaks on a hot stone, and several varieties of rosti. For a truly unique experience, order one of the raclette dishes. The server will bring to your table a special electric machine that heats a chunk of raclette cheese from the above, from which you scrape the soft bubbling cheese onto the hot jacket potatoes on your plate. It’s amazing. Drink? It flows deep and strong in Wengen. 3970 Nordwand Brau is the most local beer, craft-brewed on the other side of Männlichen in the town of Grindelwald. Rugenbrau is a more regional brew of the cheap-yellow-beer variety, brewed a short distance away in Interlaken. Feldschlossen, which has several different delicious styles, can be found all over Switzerland. Of course, there’s plenty of other beers available from all over the world. Enjoying some drink while enjoying the view of the Eiger. Sunny blue skies often feature in Wengen, which means it can feel quite warm while the actual temperatures are still low. This is the perfect situation for the beloved and popular winter holiday activity other than skiing or snowboarding: day drinking. 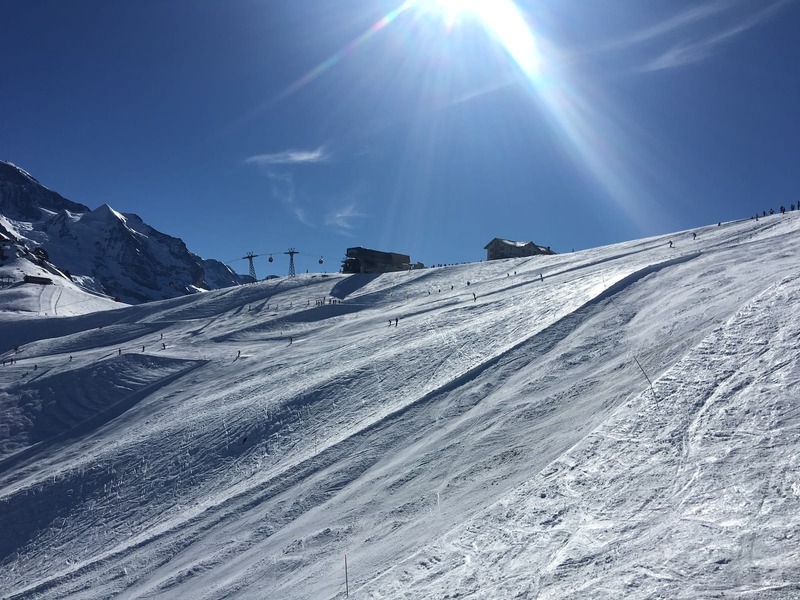 When the sun is out like this, expect every terrace and sunny spot in the village, on the slopes and in the mountains to open the outside bars and set up chairs. Sipping a delicious hefe-weizen as the sun warms your face after a good afternoon or morning of skiing? It’s heavenly. What goes best with beer and snow? Brats cooked at 7000 feet! Nightlife is alive and well in Wengen, too. Revelers into dancing and partying will enjoy the disco nights at Hasenstall, while the no-nonsense local atmosphere of the Crystal Bar will appeal to those who are looking for a drink and good conversation. The Tanne bar offers more than 40 different gin choices and 35 whiskies, and Sina’s Pub is a cozy watering hole packed with people talking about their day’s adventures. Wengen has some skiing in, or close to, the center of the village, but most of the pistes are higher up the mountain to the south and east – all easily and quickly accessible by cable car (Männlichen) or train (Kleine Scheidegg). The beginner slopes are in the center of the village, directly beneath the cable car, and most of the trails and slopes terminate in the center of town. The Innerwegen quad lift and a nice collection of trails sit just south of the village center but the lion’s share of trails, slopes, off-piste goodness and sled trails are above the village at Männlichen or Kleine Scheidegg. Wengen is part of the Jungfrau region in Switzerland. Ski passes for Wengen/Grindelwald are only 65CHF (£49) daily, and discounts are offered for multi-day tickets. I recommend spending an extra 9CHF (£7) for a pass that will get you access to lifts, cable cars, trains and pistes in Murren, Grindelwald and First for an insane amount of terrain to tackle. It would be impossible to hit everything in one week, but you’d have the time of your life trying. Männlichen – Take the 5-minute cable car ride from the center of Wengen to the summit of Männlichen and behold the vastness of the skiing and snowboarding opportunities available to you. 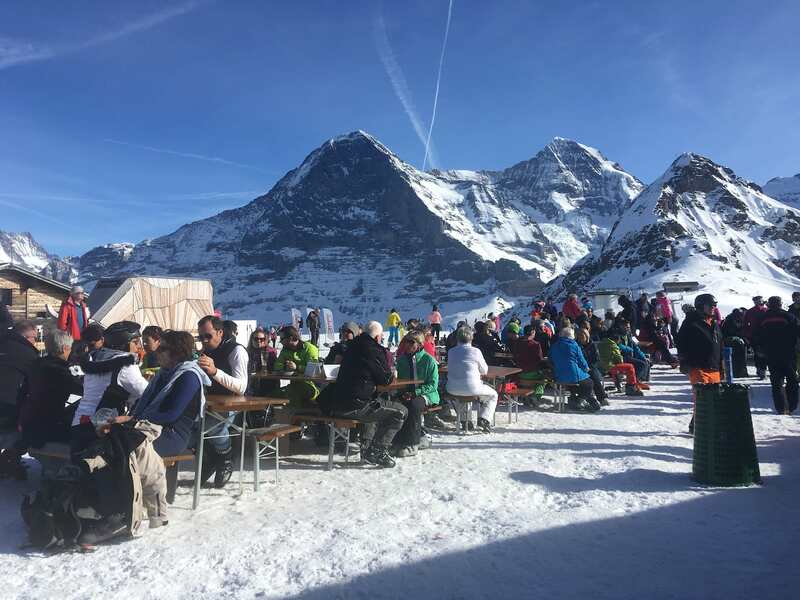 With the notorious Eiger and its Monch and Jungfrau sisters towering above, you’ll be amazed at the panorama of limitless skiing before you, reaching all the way down to Grindelwald in the valley far below. There are many marked and groomed trails and slopes leading off Männlichen toward Grindelwald or Kleine Scheidegg, but there’s even more off-piste options. I consider the trail markers simply a suggestion of where to ski or board, and it’s a lot of fun to use the off-piste bits to link up the marked trails. There are some blue (easiest) pistes on this side, but most of the terrain caters to those who like red (moderate) and black (expert) options. Yet there is a beginner slope serviced by a button lift at the top of Männlichen, next to the terminus of the gondola and the restaurant. Looking for a nice, long run? Try the Holenstien trail (#3) at the exit of the Männlichen cable car, which can be ridden for nearly seven kilometers down the mountain into the town of Grindelwald, passing everything from random Swiss barns partially covered by snow, an RV park and at least a few slopeside bars along the way. Hop on the gondola back up the mountain and then make your way down the slopes over to the Kleine Scheidegg area of the mountain. You’re skiing on summer farmland, remember. Kleine Scheidegg – Here you’ll be even closer to the foot of the Eiger. 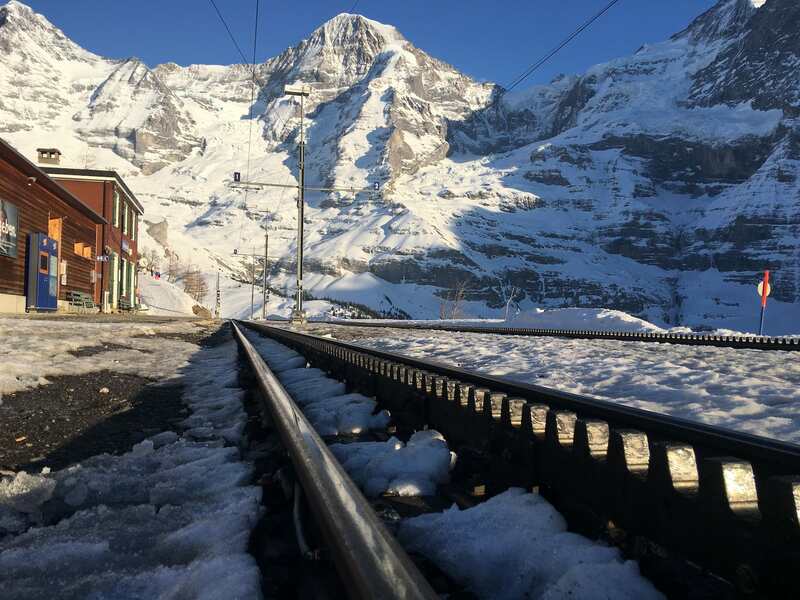 A few options for food and drink are available here, and it’s also where the train goes back down to Wengen on one side, or to Grindelwald on the other side. But why would you hop on the train when world-class boarding is available to you on either side? Kleine Scheidegg offers mostly intermediate and expert level skiing, and lots of it. However, a blue run will take skiers and boarders back down to the center of Wengen. Kleine Scheidegg is also reachable by a 20-minute train ride from the Wengen station. Keep in mind that Alp ski terrain is quite varied. 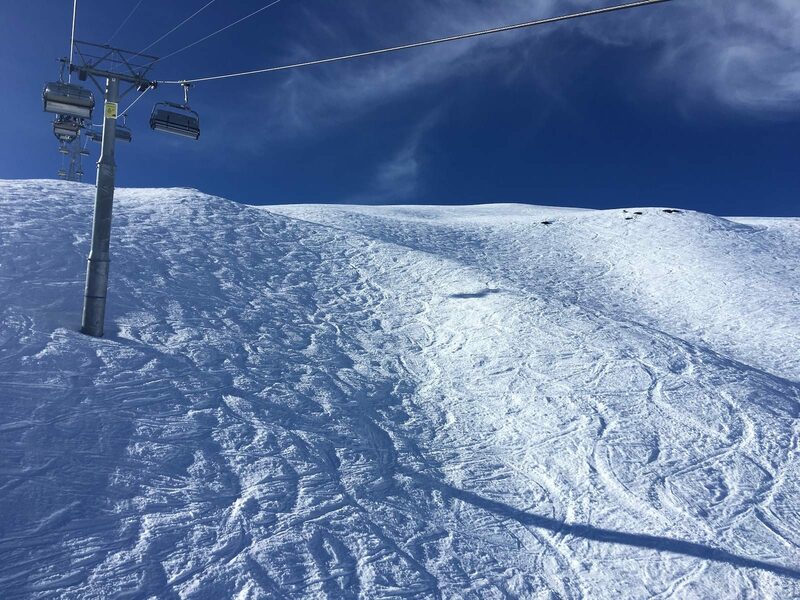 While most pistes obviously point downward, you will experience flat sections and even the oddly-placed short uphill hike. 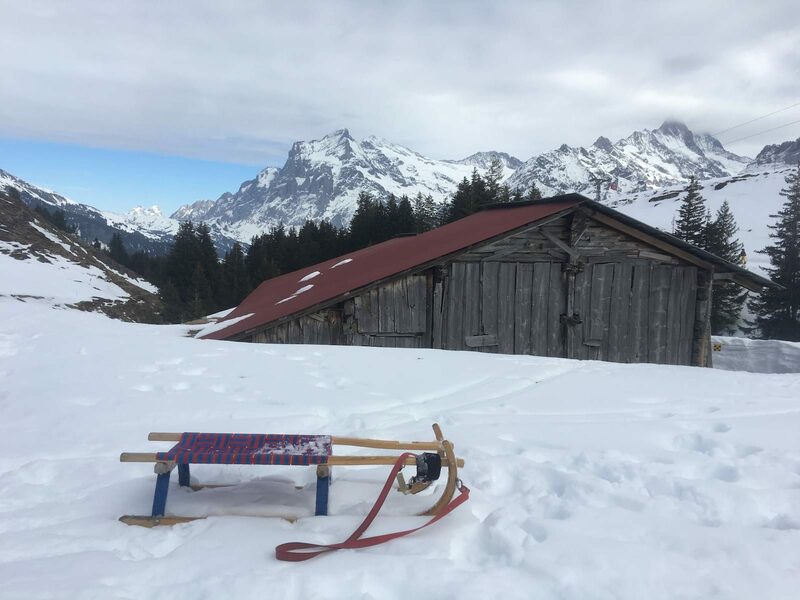 Aside from skiing, Wengen offers many miles of marked snowshoeing trails, an outdoor ice-hockey rink and enough sledding trails to keep you busy all day. One of the sledding trails runs nearly 15 kilometers from Kleine Scheidegg down to Grindelwald. That can be a 3-hour sled ride. There are definitely some steep and fast sections, so be sure to wear your helmet – this kind of sledding is might for young children. Out of this world sledding in the Jungfrau region of Switzerland. 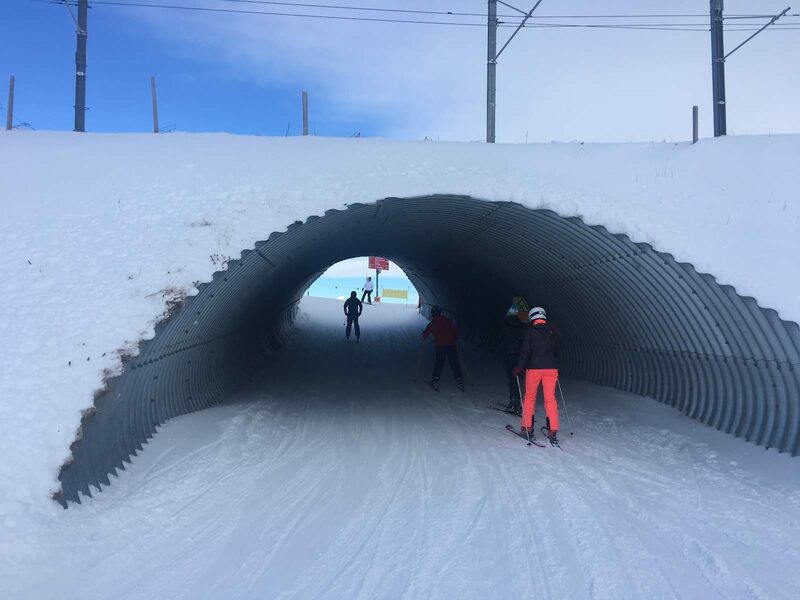 Between the slopes directly in the village of Wengen, off the back side of Männlichen and at Kleine Scheidegg, there is a dizzying number of modes to be carried uphill and options for sliding down. This is before you include the slopes and lifts in Murren, Grindelwald and First if you buy the expanded ski pass. Group and private lessons are available for all ages and all levels of skill for skiing and boarding – including telemark skiing. The children’s beginner school sits directly below the cable car in the center of town and features two surface carpets to ferry youngsters up and down the very mild pitch. A few meters south is a rope-tow that services a steeper pitch for beginners, and an elementary terrain park sets yet another fifty meters from there. There’s also a couple of learner and beginner slops at the top of Männlichen. The Wengen Ski School offers group and private lessons. 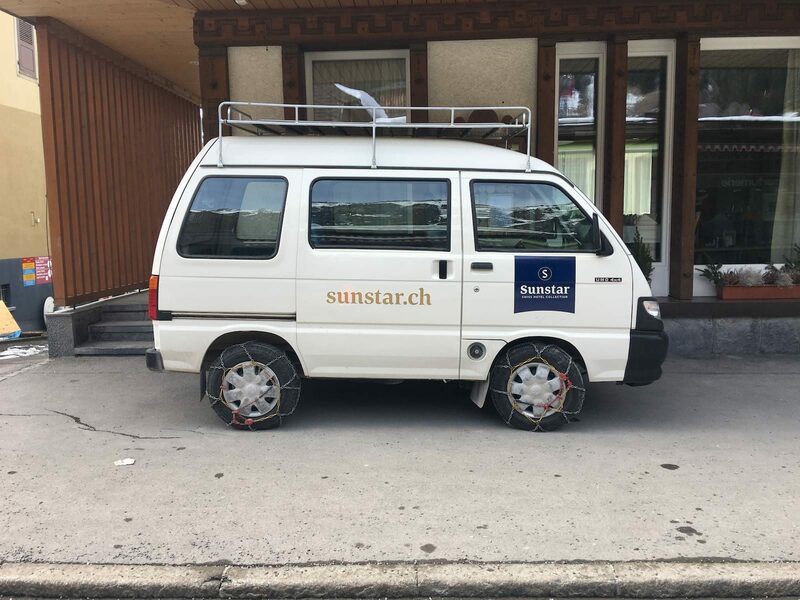 It’s best to book early during the high season. Group lessons start at about 69CHF (£52) for children, while private lessons start at 90CHF (£68) per hour. There’s a large matrix of instruction options and pricing. It’s best to consult the web site to choose what’s best for you. 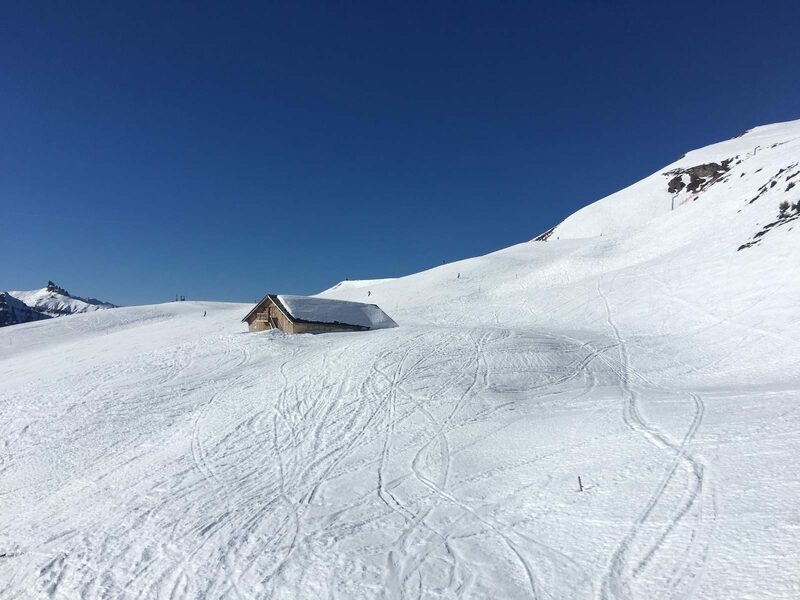 Privat Ski School is not associated with the ski area but offers another option for more private lessons for beginners or any other level of skier or boarder looking to reach the next level. There are several options for ski and board hiring right in the center of town. All of them offer top service and have deep arsenals of the latest models for all abilities. If you prefer some ultra-wide freeride skis or more narrow beginner skis, the rental options in Wengen have you covered. My personal favorite rental and retail shop is Molitor Sport, which is a Wengen institution. Their high level of customer interaction is welcoming and the service they offer is top-notch. I sometimes travel with my own board, but when the rentals available are better than my own gear, I rent. 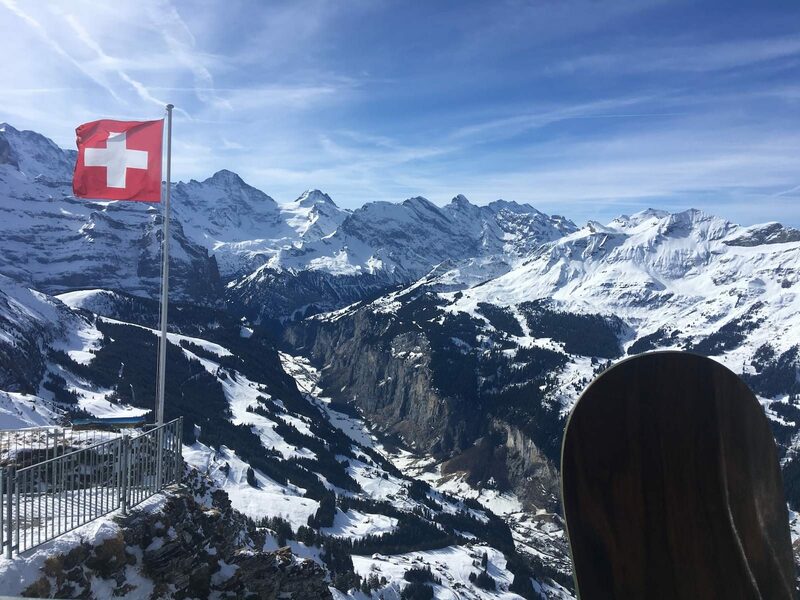 With its typical Swiss charm, amazing views, wonderful dining, and world-class pistes, Wengen is an ideal location for families looking for a weeklong holiday get away, or snowboarders and skiers seeking almost limitless options for sliding down the mountain. It’s a remote village that’s easy to reach and offers quiet when you want it and partying when you’re ready. It’s a great area , very exclusive too , advertised as “traffic free” which made me laugh as there are literally hundreds of vehicles running about on streets full of pedestrians. The fact that they are all electric just makes avoiding being run over by them more challenging as you can’t hear them coming.! Still worth a visit though if you’re a fur hat fan .